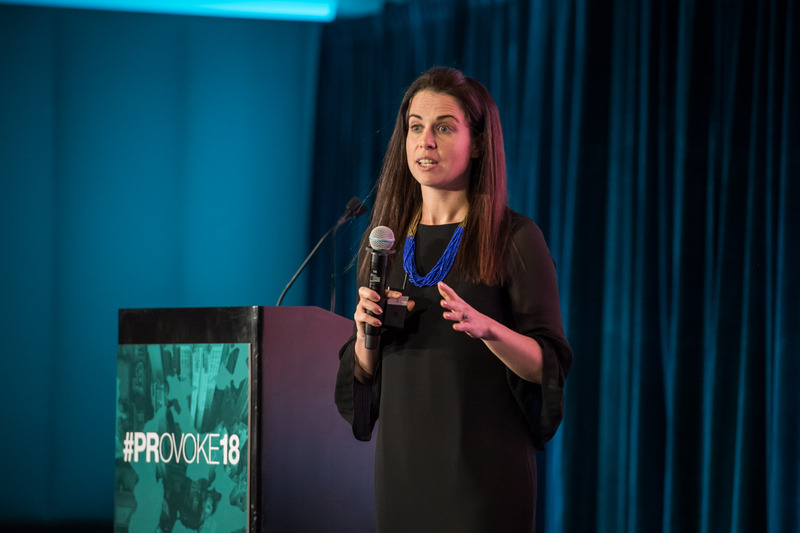 H+K Smarter's Thea Knight discussed how using behavioral science in campaigns can make them more impactful Wednesday at PRovoke18 in Washington. WASHINGTON — We all like to think of ourselves as deep-thinking types — rational, reflective and controlled — particularly when it comes to making decisions and other major life moves. As humans, though, there are several subconscious, even physiological, factors at play that influence our behavior, making it tough for us to make all of our moves deliberate ones — and even tougher for communicators who want to influence them, said Thea Knight, an H+K Smarter senior behavioral strategist. “As communicators, we have to be really careful not to assume that our audience group is (like) Sherlock Holmes,” Knight said. “We all have shortcuts in our brains … automatic thinking. We are all impacted by this unconscious decision making." Speaking at PRovoke18 Wednesday in Washington, Knight said there are ways, however, that communicators can leverage behavioral science to message with maximum impact, a process that involves using techniques that speak directly to how audiences respond well to particular positioning. For instance, because empathy has proven to be a “powerful motivator for humans,” it requires communicators to roll out campaigns that make audiences feel and understand others’ emotions. H+K Smarter, for instance, did that for Ford with a campaign that used VR to help drivers and cyclists experience the many near-misses that have made them adversaries from the other’s perspective. More than 90% of individuals who participated in the VR experience said they’d change their behavior on the road as a result; Two weeks later, roughly 60% had actually done so. Appealing to peoples' desire to conform — i.e. social norms — is another worthy tactic based in behavioral science, Knight said. “Within our physiology, feeling different, feeling like you don’t belong is a threat. You can motivate people by using what other people are doing,” she said. Framing messages so that they emphasize what target audiences stand to lose, rather than gain, by their decisions has also proven effective, as individuals tend to take losses much harder than gains, Knight said. Appealing to consumers’ sense of ownership, wanting to protect what they have, is another core means of effectively influencing behavior, she said. Jenny Isaacson, the Pancreatic Cancer Action Network’s VP of strategic partnerships, said leveraging that knowledge in campaigns aimed at boosting awareness of the fatal disease, and encouraging early detection, is reflected in their successes. Carefully crafted to appeal to those behavioral triggers, a recent messaging campaign lead to a 17% increase in Google searches around pancreatic cancer globally — and 50% in the UK alone.